Focus Home Interactive and Dontnod Entertainment have released a new trailer for the upcoming action RPG Vampyr. The video focuses on Dr. Jonathan Reid, who finds himself cursed with a thirst for human blood after losing consciousness in the streets. 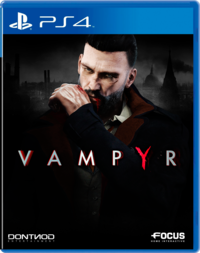 Vampyr is about his quest to find a cure for his vampiric condition as he tries to maintain his human rationality. Vampyr is set to release on June 5 for PlayStation 4, Xbox One, and PC.